Long considered the ‘silent champion’ of healthcare, In Vitro Diagnostics (IVDs) influence over 60-70 per cent of clinical decision-making, while accounting for just 2-3 per cent of total healthcare spending. But changes in the healthcare environment are driving demand for improved healthcare delivery, and sustainable healthcare depends on diagnostics. 1. How do you see the medical diagnostics industry evolving over the next 10 years? The transformation we’re witnessing in the healthcare industry today is unparalleled and sets the tone for the evolution we will witness over the next decade. I see three major drivers that will shape the future of our industry. The first is the role and relevance of technology. Technology will continue to play a pivotal role in democratising healthcare services—putting what was once accessible by a few, into the hands of the masses. It has, and will continue to, enable the transfer of medical knowledge from institutions to individuals. The ever-growing availability of health management tools and information through online and smartphone devices has made us more aware of our health needs than in the decades prior. This has brought about a fundamental shift in how we approach healthcare—organising care around patients’ needs. We can access data at the touch of a button. So the ease with which people can access many different types of information, including information about their health, is changing how they perceive healthcare. As a result, patient centricity is becoming a focal point for innovation and healthcare delivery. Patients today want easier access to care and demand better service. More and more view themselves as consumers, not passive receivers of treatment. In the future, this will become further pronounced, and its impact far-reaching. As a society, we will have to meet the growing expectations of the community. Let me elaborate. There will come a time when, through the use of embedded sensors and wearables, biomedical information systems will continually track and upload information about an individual onto a personal intelligence cloud. The information about a patients’ health will be managed in much the same way as they manage their bank accounts today. This cloud also nudge behaviour. In the case of someone with a predisposition to diabetes, he or she may get alerts to exercise more or avoid making poor diet choices. But what will be truly game-changing is that an individual’s personal intelligence cloud could also feed into a larger population gathering database. This is where the public sector will access information. For example, health policy decisions could be more tailor-made for specific populations. Which brings me to my second point. As a society, we will move from focusing on reactive treatment-based care to predictive and preventive healthcare. So instead of treating the rising burden of diseases, we hope to deploy early interventions to prevent the incidence. Electronic health records and the aggregation of research data into medical databases will allow healthcare institutions and practitioners to make the shift towards evidence-based medicine, and whilst this is starting to happen now, the scale will be much bigger in the future. Finally, healthcare systems will need to maximise value for patients by helping them achieve the best outcomes at the lowest possible cost. Delayed diagnosis can result in higher upstream costs of treatment, poorer outcomes for patients, and put tremendous burden on healthcare systems. A proven and more effective approach to healthcare is now in our grasp, one in which diagnostics plays an even more integral role. Valuebased healthcare is linked to the future of our industry because it is the best way to make healthcare sustainable now and in the longterm. 2. Do you think the diagnostics market is poised for a consistent, steady growth holding great potential in the future? What are the major growth drivers in the Asia-Pacific market scenario? Yes, diagnostics will continue to see an upward trajectory across most markets in Asia-Pacific. We know that the rising burden of chronic diseases, combined with an ageing population, has put immense strain on healthcare resources around the world. Moreover, the industry is facing growing demands from various stakeholders, with physicians seeking tools that can improve decision-making; hospitals seeking faster, more accurate solutions; laboratories looking for ways to efficiently use existing resources; and health systems adjusting their delivery models to reduce healthcare costs. In this changing landscape, diagnostics is emerging as a key driver in helping to address these needs. The in vitro diagnostics (IVD) market in Asia-Pacific is expected to reach US$19.64 billion in 2021 growing at a CAGR of 6.3 per cent1. This growth will be fuelled by several factors. Asia-Pacific is home to more than half of the world’s population and a bulk of this population is still hugely underserved. The region is made up of diverse countries with varying needs; we have developed countries in the region with well-established healthcare systems and other countries where healthcare delivery is still in its infancy. Furthermore, countries like China and India are seeing the emergence of second tier cities, while healthcare is still concentrated in the major metros in countries such as Vietnam and Indonesia. But the needs are the same: getting more value out of healthcare. 3. What are the areas of development or growth? As the population ages and the prevalence of chronic disease rises, patients require frequent monitoring and often for longer periods of time. This has fuelled the demand for diagnostics tools for monitoring. In the case of cardiovascular diseases, biomarkers such as Troponin T and NT-pro BNP help doctors to diagnose as well as monitor and better manage the patient’s condition. Another area of growth is in the use of predictive biomarkers, as healthcare systems are starting to realise the value in being able to detect at-risk patients. If we can one day predict cancer before it occurs, we can intervene early with the right treatment and save lives. This is a significant change from the current approach of waiting until symptoms show before identifying the condition. We will also see an uptake of companion diagnostics, where a device or tool is used in conjunction with treatment. Patients can take tests that identify the exact mutation of their disease, allowing for more targeted treatment, and doctors can monitor and manage the progression of a disease. Finally, Point-Of-Care (POC) testing—where speed of information is vital—can help doctors perform tests using smaller machines close to the patient, rather than in a laboratory. This offers huge potential in Asia-Pacific. For instance, the POC Troponin T test can be used in places where heart attack patients are first seen: an ambulance, the emergency room, in a primary care setting or the general practitioner’s (GP) clinic. Since it requires no sample preparation or lengthy setup procedures, healthcare professionals can quickly identify patients with a suspected heart attack in the pre-hospital and emergency room setting, helping to ensure correct diagnosis and appropriate interventions. 4. In what ways do you see diagnostics revolutionising healthcare? 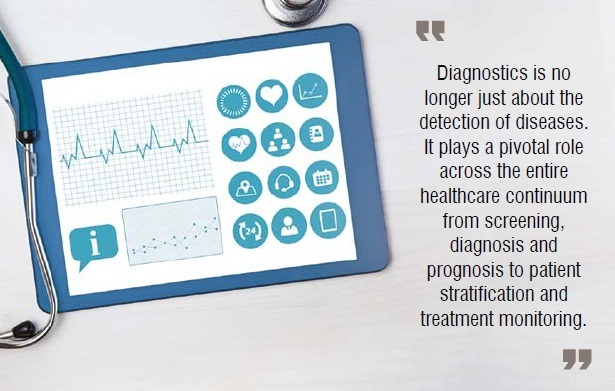 Diagnostics is playing a significant role in shaping the transformation of the healthcare industry from volumebased to value-based care, where not only is care organised around the needs of patients but also allows healthcare providers to deliver measurable value and outcomes at lower costs. Diagnostics can enable the shift from reactive, episodic treatment to predictive and integrated care. Earlier, personalised interventions can reduce health problems; help avoid adverse outcomes; decrease time spent in hospital; and help to avoid the cost of late-stage or unnecessary treatment. Increasing the use of appropriate diagnostic testing provides one of the greatest cost-savings opportunities around the world. In the US, for example, it has been estimated that earlier detection of certain cancers could save around US$26 billion per year2. Closer home, a study in South Korea found that the early detection and treatment of common cancers can result in considerable savings in treatment costs. Advanced stage at diagnosis was associated with a 1.8-2.5 fold increase in total cost3. Diagnostics is no longer just about the detection of diseases. It plays a pivotal role across the entire healthcare continuum from screening, diagnosis and prognosis to patient stratification and treatment monitoring. It helps to enhance clinical practice and quality of care, and ultimately improve patient outcomes. So I would say that whilst diagnostics has always been one of the foundations of healthcare, it is now positioned to play a key role in revolutionising healthcare. Diagnostic solutions empower doctors to make the right decisions, allow patients to have more control over their health and well-being, and give payers and policymakers the confidence that they are investing in the right solutions. 5. What are the major innovations impacting the healthcare system in Asia-Pacific? Artificial intelligence, robotics, embedded sensors and digitisation are already, and will in the future, disrupt our industry globally, not just in Asia-Pacific. 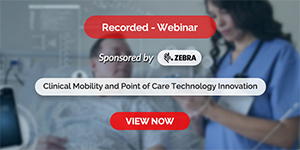 Rapidly ageing populations, the prevalence of non-communicable diseases, the shift towards chronic conditions, and an increasingly knowledgeable consumer base who expect high-quality care at an affordable price are driving the need for such innovations. However, the sheer size of the population in this part of the world and the non-homogenous healthcare delivery models means the impact is much more pronounced here. However, as with any innovations they must bring value. At Roche Diagnostics we are committed to this. As we continue to advance innovation across the patient care pathway, we are pursuing our vision of delivering tangible value to healthcare systems. The result we aim for is better, healthier lives for patients and better equipped healthcare systems that can meet the changing needs of patients and address pressing public health challenges. 6. What do you see as the biggest challenge in the current diagnostics market? As a tool, diagnostics is still massively under-valued and under-utilised. It represents just 2 per cent to 3 per cent of all healthcare spending but influences 60 per cent to 70 per cent of medical decision making. This shows that while there is very little spent on diagnostics, the amount that is spent has significant influence on clinical decisions. As an industry, we need to articulate the role of diagnostics in delivering sustainable healthcare by highlighting the value it provides across the entire healthcare continuum. This cannot be done by any one company or country, and requires an industry-wide effort to help uplift the knowledge and understanding of the role of diagnostics within the healthcare environment. One way to do this is by educating various stakeholder groups on what the value of diagnostics means for each of them. For governments, it could mean cost savings at a national level that allows for resources to then be allocated elsewhere. For a patient it could mean access to the right treatment at the right time. It is when we collectively harness the true potential of diagnostics that we can enhance the overall standard of care. 7. You oversee the entire Asia-Pacific arm of your company. How do you ensure the region stays agile and innovative? Part of our philosophy in Asia-Pacific is ‘strong locally, powerful regionally’, ensuring we empower local operations while still leveraging our regional and global network when needed. Given the differences between markets in Asia, we’ve categorised our smaller market into two sub-regions–established markets and high growth markets – so that countries with similar needs and challenges can learn from shared experiences, the exchange of knowledge and best practices to ultimately benefit patients. This starts by understanding where countries are in their journey. In more developed countries, the conversation revolves around maximising return on investment, high-throughput instruments to cope with the volume, and performing new tests. The focus is on affordability and the use of high medical value tests. In developing countries, the concern pertains to coverage, logistics and limitations of infrastructures. The question typically is "how can we make this test accessible to everybody?" So, our aim in Asia-Pacific is to support the needs of the countries by making available diagnostics solutions and expertise that can benefit the community. This ranges from supporting infrastructure and capacity initiatives in countries such as Myanmar, to working with industry associations to address unmet medical needs. For instance, in Vietnam we are spearheading a LEAN Clinical Laboratory Practice programme in partnership with the Asian and Pacific Federation of Clinical Biochemistry (APFCB), the Vietnam Association of Chemical Biochemists (VACB) and others to improve laboratory quality standards in the country. In Hong Kong, we are running a pilot programme which aims to decrease cases of cervical cancer in the underserved communities. In India, we are working with various stakeholders at a national and local level to increase the access to safe blood. These are just some examples. Across the region, our efforts are focused on delivering the best possible diagnostic solutions that can improve patients’ lives and address unmet medical needs. Lance Little became the Managing Director, Region Asia Pacific for Roche Diagnostics in 2012. In this role, he oversees 16 markets across the region. Lance joined Roche in 1995 and has since held various management and leadership positions across technical support, sales and marketing.